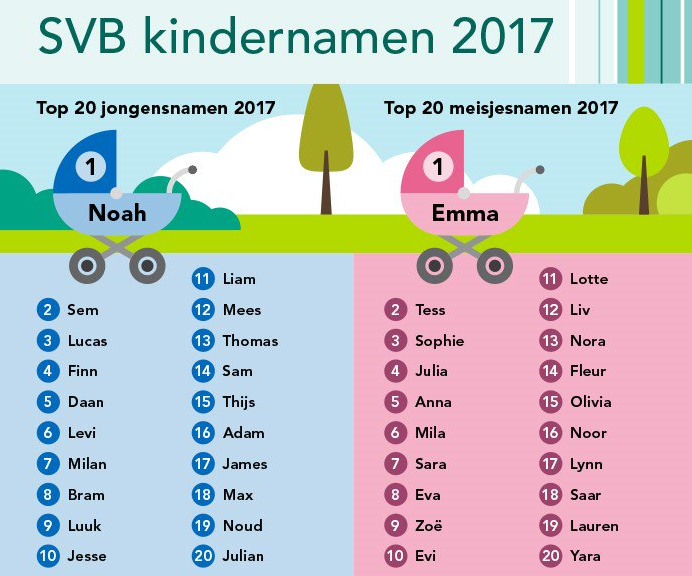 The name Noah was putatively considered the most popular boy’s name for 2017, having been given to 635 new-born boys in the Netherlands. But as VoE reports, a journalist from broadcaster Powned did some research into the database, however, and noticed that another name, a non-traditional Dutch name, was slightly more prevalent. This journalist checked for Mohammed and its alternative spellings. Mohammed 221, Mohamed 211, Muhammed 110, Mohammad 51, Muhammad 43 and reached a total of 636. Other forms like Mohamad, Muhamed, Muhammet, Mouhamed, Muhamad and Mahamuud could not be checked for “privacy reasons”. Of course, other forms of Noah like Noa and Noach should be checked as well for the sake of fairness: both, however, were not listed according to the Dutch journalist.